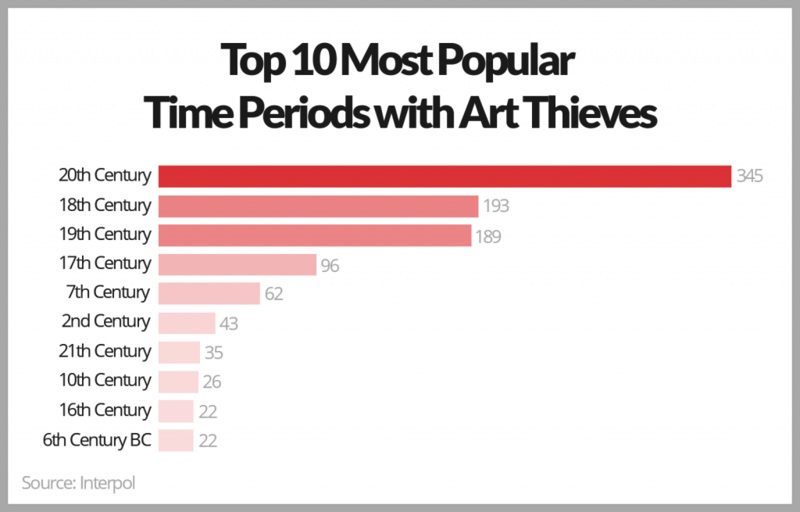 Each year, art thefts account for around four to six billion dollars of losses worldwide. Due to the magnitude of the problem, the International Criminal Police Organization, commonly known as Interpol, continually collects data about the many art thefts and recoveries. With 192 member countries, the international police organization catalogs around 50,000 stolen works of art. 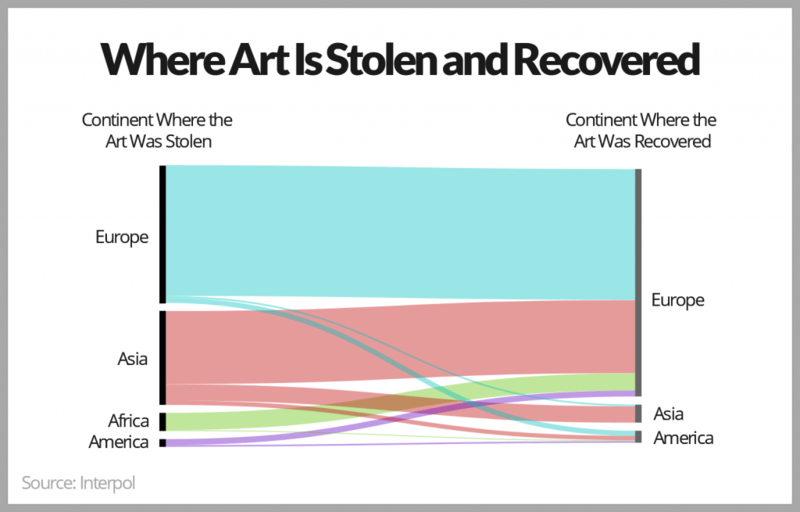 Using Interpol’s wealth of data, a recent analysis by Element Paints has taken up five major questions surrounding the global crisis surrounding where art is stolen from, what is stolen, and where the work most often ends up. 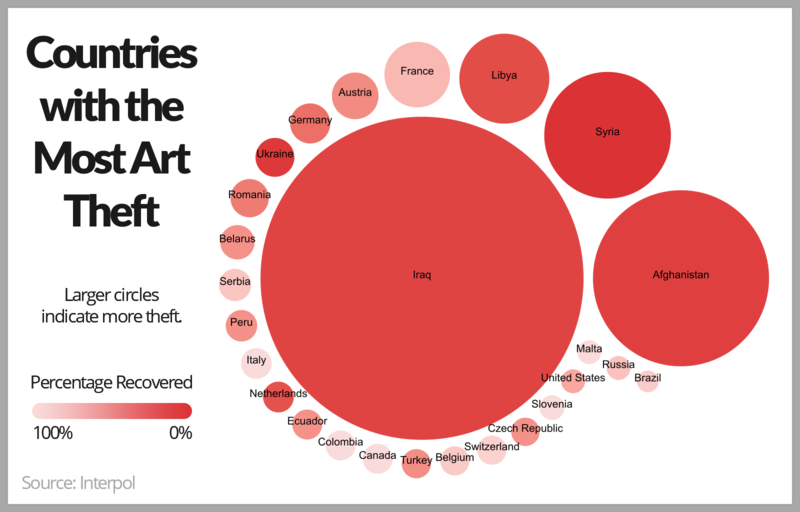 It is perhaps not totally surprising that the countries that most often fall victim to art thefts are war-torn countries like Iraq and Syria. But right behind them, the seven largest hubs for art thievery are all in Europe. 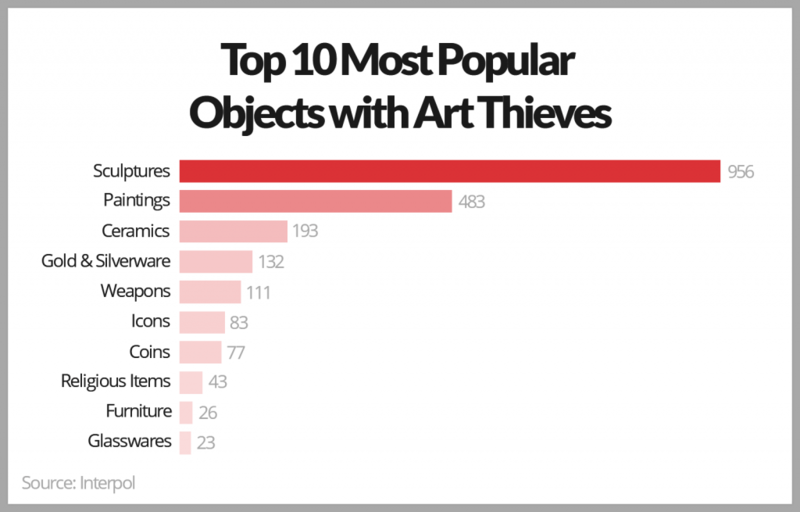 Most shockingly of all, the vast majority of stolen artworks from all around the world end up in Europe as well, with paintings, sculptures, and religious items being the most sought after. According to Interpol’s data, artworks are most often recovered in Paris, but the second most common city of retrieval is a little known Serbian city called Arandelovac, which slightly exceeds the recoveries of artworks in London. The Serbian city’s geography makes it a convenient hub on the trail between the Middle East and Europe. Interestingly, the vast majority of stolen works date from the 20th century, and are not taken from museums or places of worship as often as from private homes by breaking and entering. The data from Interpol, which has been working on countering cultural property theft since 1947, considers all artworks including archaeological pieces, antiquarian books, antique furniture, coins, weapons and firearms, and ancient gold and silverware. Element Paints’s analysis considered 4612 unique records of art theft dated from 1991 to 2017 and excluded firearms in their methodology.